I hope you have had a great weekend! We are covering a lot in this week’s email so try to bear with me. Both Megan and I will be away this week. Micki will run with you as an extra coach as will Litsa Savastano. For the run, we will be running a total of 22 minutes, slipping in a few 4 minute blocks. Going forward, the amount of time spent running starts to increase more quickly since you have built the base you need to start to run longer. It is really important to get that second run in each week so you keep that base up and build from there. Anyone on this list who hasn’t been out running with us – now is the time to jump in before we are too far along in the program. It is possible that the race will be announced this week while I am away. I know for many of you the idea of a race is surreal and a bit crazy. But I also know several of you feel that way yet are determined to make it happen (YAY!). If you are ready to commit, I would encourage you to book your flights as soon as the announcement comes out. We are a large group of runners and I have personally witnessed the flight prices increase in prior years as runners book their flights. I wouldn’t want you all to wait to book and miss out on cheaper prices. If you are not ready to commit, that is fine, too. We will have the beginner breakfast next week to talk about the race and hear from past beginners which may help allay your fears. But you don’t have to decide right now or even in the next few weeks, I promise. We are going to try something new this week at the start. Rather than walk for 5+ minutes to warm up, we are going to do a series of exercises designed to get your muscles warm and limber. Hopefully we can build this into our routine and it would be great for you to try it on your Tuesday run as well. I don’t have a proper link for the exercises as they were prescribed to a runner friend from a physio to help her avoid injury. The coaches this week will lead you in the exercises and I will send you what I have in next week’s email so you can try it on the following Tuesday. Victor St. Ange is the physio that many people in the running group use. He is terrific and he can do an overall analysis of how well your muscles are engaging as they are needed. The con is that he is very popular and it can take a few weeks to get an appointment. Many runners also swear by Christian Antonee and I believe he is easier to book on short notice. We heard from several of you that the Tuesday runs have been a bit fast. This is very common with the beginner group. It is hard to keep a slow pace, but it’s important to try to do it. You will all feel better for it. If you are in the front, don’t feel the people behind you are pushing you to go faster – they aren’t! And if you’re in the back, you don’t need to try to keep up with those in the front. Run the pace that is right for you. You should be running around a 13 – 13 ½ minute mile on Tuesdays, maybe even slower. This translates to a little faster than an 8 ½ minute kilometer. You can use apps on your phone to show your pace. Apps I’ve used in the past are MapMyRun, Runkeeper and Strava. You do not need a running watch! As a beginner, it’s nice to be able to focus on building your stamina and creating a bond with your group, not worrying or thinking about your pace and distance. Use the apps to guide your pace, as a quick check in. Also, make sure you set it to auto pause so it doesn’t calculate you standing still as part of your pace – otherwise it will show your pace as artificially slow. If you are feeling like you don’t want to talk during the run, SLOW DOWN! Sometimes it helps to designate a person to keep the pace and you can switch off each week. Let us know how it goes! You are all doing so well! I was about to say it seemed to be a walk in the park for you, except for once we weren’t in the park… ? 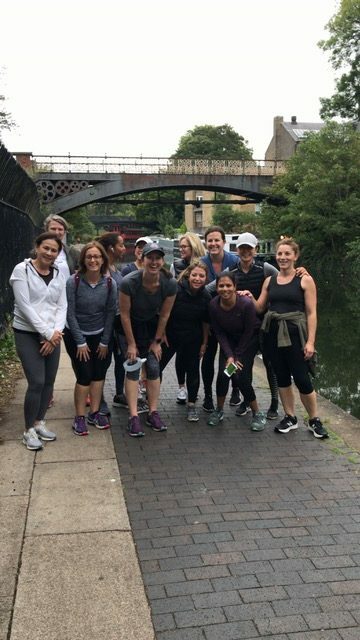 As we noted on the run on Thursday, the canal is a great place to run out for a distance and turn around at the halfway point. It allows for non-stop running and it’s easy to get to. But please always be careful of the bikes! If you haven’t yet joined the group, there is still time to join us and not be far behind, but please join us this week! Or let me know if you’d like to punt out a year and I’ll keep your info for next year if you’d like. Thursday 11 October – we will be having a we will have a little gathering after the run at Megan’s house (right next to ASL) to talk about the race (which should be announced in the next week or two). It will be a chance to hear from some former beginners about their experience, ask any questions and just be social. Thursday 18 October – Big Ben! We will be running to Big Ben this day, believe it or not! So clear your calendars so you can join us for this major beginner group milestone! Don’t worry – there will be many traffic lights and stops along the way, and you’ll be ready for it, we promise. Now that we are a few weeks in to the program, we wanted to give a bit more information on shoes, nutrition and aches/pains. Shoes – if you are feeling like you want/need a new pair of shoes, you can go out at any time now and buy some. Runners Need and the Asics store on Oxford St both do gait analysis and will help you find the proper shoe. However, you do not need to go out and buy a new pair of shoes if you are feeling like yours are fine. There may be a point when we will advise you to get a new pair of shoes because if yours are getting old, they won’t have the support you will need as we start to increase our run times. But for now, as long as you’re comfortable, you’re fine. Nutrition – it’s good to eat a little something before you come out to run, but you don’t want to eat a lot. Everyone is different in what works for them so try different things each week and see what works for you. Things to try – a banana, yogurt, toast with peanut butter, a granola bar. It’s fine to have coffee before the run. When we are running longer distances, we will give you more information about nutrition for before, during and after the run, but we aren’t to a point yet where we need to be thinking about it. More things to look forward to! Aches – some of you may be experiencing some aches and pains. It is common to have some aches and pains during the first 2-3 months of this program. For the most part, it’s just our body’s way of telling us “Thank you very much, but I would prefer hanging out at Starbucks and skipping the running part.” Many of you are already fit through other types of sports/hiking/tennis/etc, but we use different muscles in running and those muscles/joints will speak up. As a very general guideline, most experts suggest ignoring any pains during the first 10-15 minutes of an exercise session then after that monitoring whether the pain/discomfort is stabilizing or increasing. If the pain increases while you are running, then you should stop – if the pain is consistent or lessens during exercise then usually you’re fine to continue. There are experts such as physios listed on the womenrunningtheworld.com website if you are interested. All of us will benefit from lots of stretching and some squats or lunges whenever you have a bit of time. You don’t have to go to a gym to do squats/lunges – you can do them anywhere. Those exercises build muscle in your legs particularly around your knees. The stronger those muscles become the more they can help to stabilize your knee joint which is extremely helpful in running. Don’t let these suggestions overwhelm you! None of it is required, it’s just the more you do, the easier the running will be. Lastly on this topic, we are still only running twice a week. This is SO important. Feel free to do as much walking as you want, and tennis, or swimming, yoga, pilates or whatever….. but not running. Twice a week is the perfect amount right now. In a month or so we will come to a point where we’ll tell you it will be good to add a third run, but not yet. For this week, as usual, please repeat last Thursday’s run on Tuesday. Also, please look out for new people joining and welcome them – we may have a few new additions this week. This Thursday is the first PCA meeting at ASL. I know some of you would like to go to that meeting so we will offer two coached run times this week – the regular 8:15 am time and then right after the meeting (which I think is around 10:30?). Please either RSVP to me or to your What’sApp group so we can get a headcount for each time slot. This Thursday’s run time will be just a slight increase from last week’s. We are taking our time building up to make sure your bodies are becoming adjusted at a nice slow pace. As always, please let one of us know if you are hurting or struggling. If you are on this email and are not planning to join us this year, please let me know – we won’t take offense! We don’t want to junk up your inbox any more than it already is. But if you are planning to join, come on out! It’s not too late to get started. Well done on Thursday getting through those 2 minute running intervals with apparent ease. We are so glad so many of you were able to run together on Tuesday. It’s great to start to set that routine early on. So for this Tuesday, as for last week, repeat what we did this past Thursday based on the training plan we sent out last week. Welcome to those of you just joining us. I hope you can make the run this Tuesday. Just look for the group at Barclays and introduce yourself. This is a very friendly group and they will take care of you! Our beginner groups in the past have found it really helpful to set up a beginner What’sApp group. This makes it easy to connect with one another if you can’t make a Tuesday or Thursday run. For example, I believe next Thursday there is a 7th grade coffee – so if more than one of you wants to go to that, you can send out a message and see if you can run together after. So I’m hoping one of you can take on organising that! This is just for you guys – the coaches don’t need to be on it. This week we will be adding one 3 minute interval running interval to our two minute ones. It is absolutely essential we keep the pace very very slow so we don’t allow our heart rates to get too high, both for psychological reasons (so you don’t feel exhausted and worn out when you finish, and start hating it) and for physiological ones (as most of you haven’t run before, you need to give your bodies time to adjust to keep injuries at bay). Please let us know if anything is hurting. Most aches and pains can be quite easily addressed early on – it’s continuing to run on an injury that causes bigger problems. A note on the pace – I had said in an earlier email that you should be running at a pace where you can talk comfortably. This is true, but that doesn’t mean you need to be talking all the time. It is perfectly fine to not be talking – I just want to make sure you CAN talk. Otherwise, you are going too fast. We will not be doing much street running just yet, but please make a point of being very careful at the few road crossings we do have – it is very easy to just follow the person in front of you out onto the road without checking for cars or bikes, so please be careful! I can tell you, though, that every runner will have her favorite belt for various reasons so it often comes down to trying one and if it doesn’t work, trying another. Also, if you go out to a store to check out running belts, it might be a good idea to also get a pair of running gloves. It will start to be chilly in the morning and you will want something that doesn’t soak up the sweat. This is not a necessity certainly, but just wanted to put it out there. Finally, if you are on this email list and have decided to not join our group, please let me know and we will take you off the distribution. Otherwise, it is certainly not too late to join us! We are off to a great start! We are so excited to get to know you – we clearly have a fabulous group this year as usual! I know that Jess Browne, our fifth coach who could not be with us this week, is really looking forward to meeting you all this week. So… this is a long email with lots of information so please bear with us. We have attached our program as a two page PDF. Please note, however, that the race date is not yet determined. I have based this schedule on an assumed date that may not be the actual date. Once the race is chosen, I will revise the schedule if needed and resend. One page is the specific running/walking intervals week by week. The other page is more of broad weekly view of what we are doing. For those of you who are just joining us, don’t worry! You’ll be fine. Our routine is this: on Thursdays the coaches will run with the group. The following Tuesday, the group will meet at Barclays at the same time (always 8:15 am for an 8:20 start) and repeat what we did the prior Thursday. To time your intervals, we find that an app called IntervalTimerworks very well. I’m sure there are others out there, but that one is free and fairly easy to set up. It generally works best if someone is the official timer person each Tuesday and someone else guides the group. 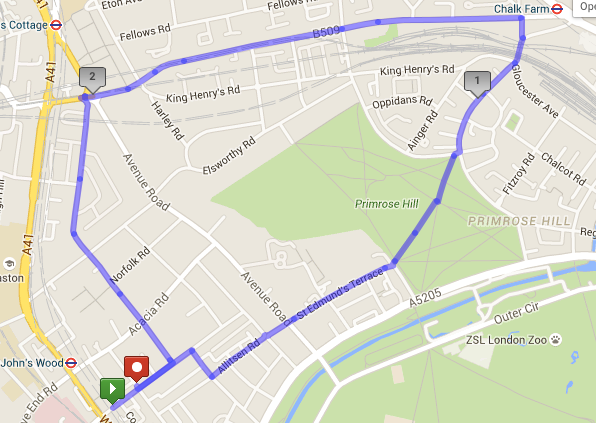 We will be running in Regent’s Park for the first few weeks so it’s not too tricky to guide. We are happy to help you all manage it – just ask! For anyone who was not able to join us on Thursday, just show up on Tuesday, introduce yourself, and you will be fine. Also, if you find you cannot make a Tuesday or Thursday run, try emailing the group to see if there are others who might be able to join you later or on a different day. So for this Tuesday, follow the intervals in the program for week one. The key for the Tuesday runs is to go SLOW! During the first few weeks of our program, we’ll continue to have additions to the group and start to see some attrition. Usually by October, the group settles into a pack and running becomes part of your weekly routine. For any of you who have some running experience, please consider moving up to our Mon/Wed/Fri groups. We have another 100+ runners who run a wide range of pace and distance. You will have people to run with and you will be able to keep up. The beginner group progresses very slowly and we will continue to keep the group running at a very slow pace. It’s part of the master plan!!! One last thing here… if you are already a runner (therefore have a natural pace/gait), running this slow can actually hurt – that slow pace will create an unhealthy amount of impact on your joints and can throw off your already-developed gait. 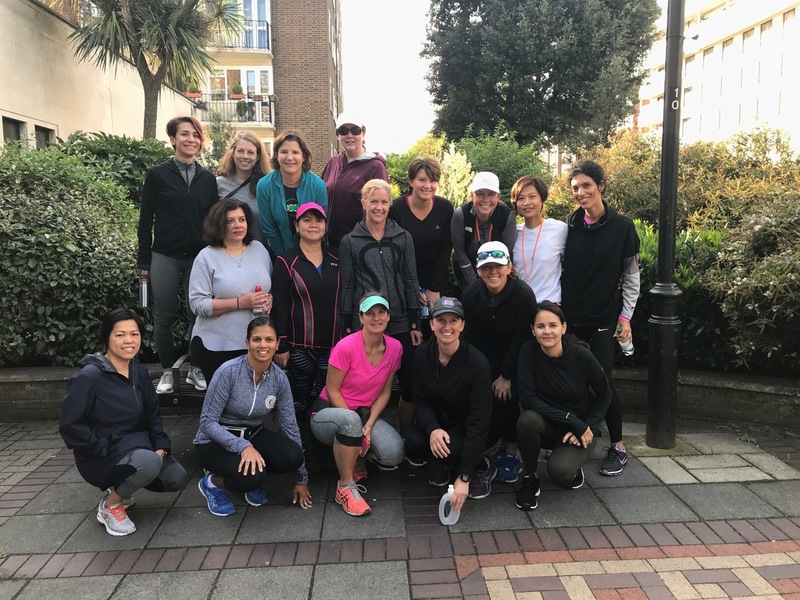 Let me know if you want to discuss this – we are happy to talk about how you could transition to the next level in our running group. Lastly on this topic, if you are already a runner, after a few weeks you’ll be running circles around our true “newbies”. It’s depressing for them to feel that they are working SOOOOOOO hard and you’re flitting around as though it’s a gentle stroll in the park. I know a few people asked whether we run through the winter and in the rain. The short answer – yes! The only time we cancel runs would be for icy conditions which are dangerous. Otherwise, we run in rain, sleet, snow, hail, etc. That being said, you might consider buying a good running rain-jacket. It needs to be lightweight and breathable. Runners Need sells them as do most of the outdoor shops, or ask any of the coaches for recommendations. You might be surprised to hear that we don’t usually have to run in rain. We like to joke that the sky clears for WRW – it will be raining as you walk to Barclays and by the time we start running, it’s over. And if it does rain, it passes over quickly. It’s rare we run in heavy rain (Wednesday’s rain was an exception, I swear!). If you’re in the market for new shoes, we recommend waiting a month or so. Often,as you start running each person develops a gait and it actually improves (or becomes more efficient) over time. If you go in now for shoes, they may fit you in shoes that are appropriate for your current gait. That gait may very well change in the next few weeks so hold off if you can make yourself wait! OK – the last few things. 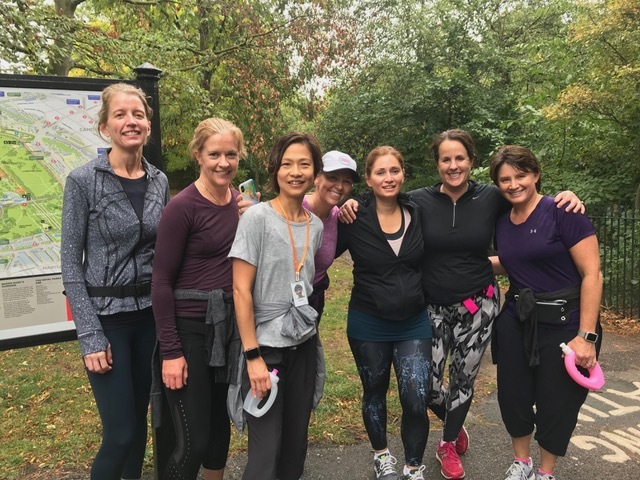 First, our running group has a website: www.womenrunningtheworld.com.We will post this email under “Beginners” so if you misplace it and are looking for information, you can find it there.Our program will also be out there as well as some route information if you’re interested. So the website could be helpful but don’t worry about any of the other information posted out there for the Mon/Wed/Fri group. Second, our group has a Facebook page – WRW London. You can request to join and we will add you. 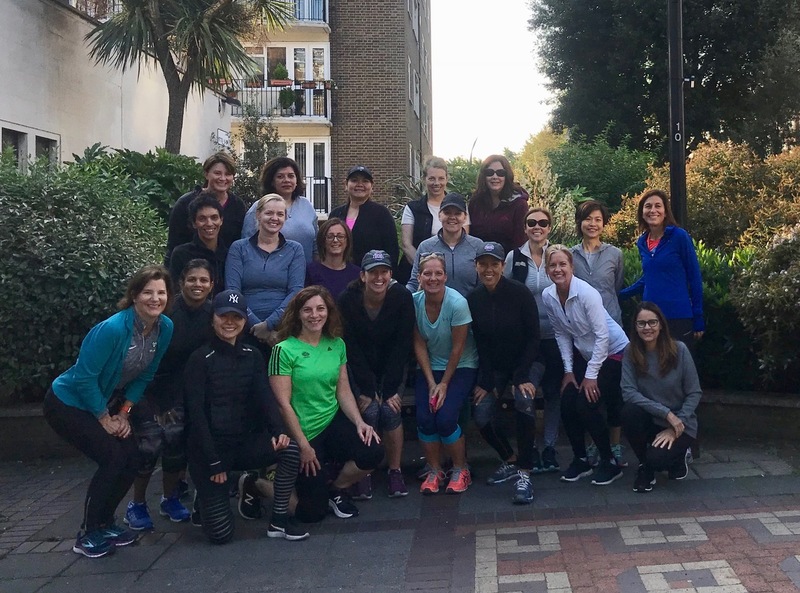 Next, the first St. John’s Wood Women’s Club meeting is this Tuesday (4 Sept) at 9:30 am at the Liberal Jewish Synagogue at 28 St. John’s Wood Road across from the cricket ground entrance. If you are not already a part of this club, I encourage you to come to the meeting to see what it’s all about. It is completely acceptable to show up in your running gear so it could be fun for you all to do your run and head over together. If you have any questions about it, feel free to send me an email. You can also check them out atwww.sjwwc.org. Finally, here is the photo from our first day. It’s going to be fun to look back and see us all at the start of our adventure! We look forward to seeing you on Thursday and hearing about how SLOW you ran on Tuesday!